Sony's juggernaut console is constantly advancing and attracting more sales. It's the number 1 hot-selling console that everyone who doesn't currently own actually dreams of having. Here are some games that you must play when you do actually buy this amazing console. Nathan Drake is back to finalise the amazing series.It's a game that was recently released and has achieved many 10/10 scores from the top journalists. Fans were not disappointed, it's a game that many were waiting for and has surpassed expectations. Seriously, it looks stunning, the visuals are simply gorgeous. The game takes you on an epic adventure from locations around the world. Discovery and puzzles mixed with action are some of the key areas that make Uncharted 4: A Thief's End so stunning. This is an absolute must-play game - put it on your list. Another PS4 exclusive makes it on to this very list. At first sight this title might looking nothing more than a children's game. Actually, it become a best-seller because adults love it too. The graphics are elegant within and deliver a colourful cartoon themed charm. The adventure takes you around some amazing levels. You'll come across bosses that create a difficult and challenging battle. Plenty of action and entertainment with RPG elements make this a must-play title. Consider Ratchet and Clank if you love this type of game. Any fan of fighting games shouldn't miss this title. 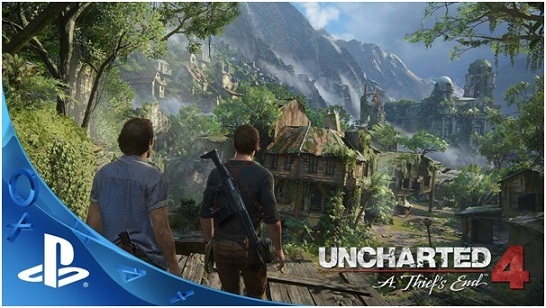 It's similar to the other games in the series but brings the power of the PS4, producing great graphics. You'll find that a PS4 arcade stick will transform the experience, it's just not the same without one - so if you do pick up Street Fighter 5, also consider buying a good fight stick. Sales of the game haven't actually reached the expiations, but fans of fighting genre cannot skip this one. Favourite characters such as Birdie and Sammy are included, what's more a few new ones such as, Laura and Rashid are also introduced. How could we not put Grand Theft Auto V on this list - it's such a fantastic game. Open world is an awesome feature to any game and this offering from Rockstar does it better than most. Stealing cars has never been more fun. The online mode brings so much more than the single player could provide, and this means that the game never gets old. One thing I really like is that seasonal events are added, take for example, Christmas, snow is added and it makes you feel great. I can't find of a reason to suggest you shouldn't get this masterpiece. Just get it already! Other major titles will be coming soon, GT Sport isn't far away and will give a much needed title for fans of the racing genre - yes, you'll have a good reason to get a PS4 racing wheel upon release. More adventure games are also on their way such as Horizon Zero Dawn. With a growing available choice, these 4 games mentioned should be considered for any PlayStation 4 owner. Which games do you love the most? Leave your options in the comment section further down.